You must pay for your own Domain Name, Web Hosting and SSL Certificate yourself. JH Web Designer can set up all of this for you at no charge with GoDaddy.com. When you pay $599 upfront and in full, you will receive a $100 dollar voucher via email, covering Website Updates or Graphic Design work to use at a later point after the initial project is completed. WooCommerce Add-ons that cost an extra fee, are not covered with this package. Please fill out the following form below with your information and project details. Afterwards JH Web Designer will send you a PayPal Invoice based on the Payment Type you have selected. If you do not have a PayPal account that is OK, all you need is a valid Credit Card in order to pay the invoice. 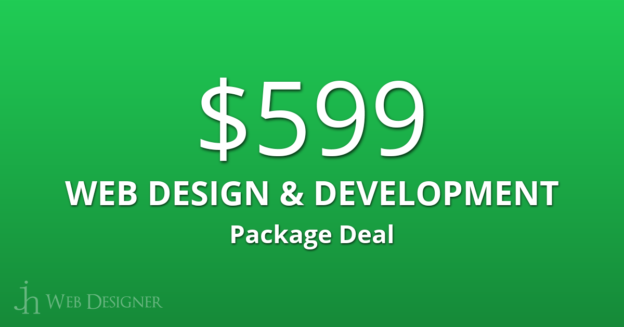 Before filling out the following form below, if you have any questions regarding the $599 Web Design & Development Package Deal, please call 316-842-4906.